When we moved to this farm in 2013, we hoped to restore the century barn on the property but the roof had been leaking for years and had caused the main support beams to rot. We hired Byler Construction to build a new barn on the existing foundation. Byler Construction consisted of three young Amish men. They constructed our mortise and tenon barn in only three months. 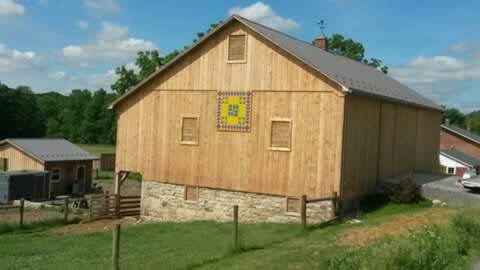 Thus my barn quilt "Flying Amish" using Amish colors and design.